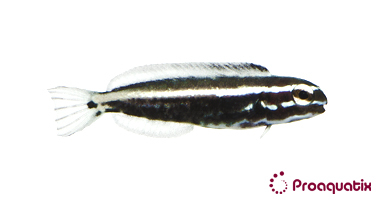 The Kamohara Blenny has an inky black body with a prominent horizontal, metallic white line that stretches from the eye to the caudal peduncle with random white speckles on the face. Juveniles will have more metallic white stripes, bands, and scribbling that will dissipate as they mature. Behavior:This species ignores other species. They are often present in mid-water, hovering near its favorite rock crevice.